December 12, 2015 marks the 100th birthday of Frank Sinatra. Sinatra’s singing career spanned seven decades starting in the 30’s until shortly before his death in 1998, winning him eleven Grammy Awards. Even those born after his death know his iconic songs such as “Love and Marriage,” which was used as the theme song of the TV sitcom Married with Children. Sinatra is one of the best-selling artists of all time, having sold more than 150 million records worldwide. He is considered by many to be “the greatest singer of the 20th century.” Led by the energetic and creative Music Director Steven Reineke, The New York Pops Presents Let’s Be Frank affectionately and admirably paid tribute to the prolific and unique singing career of Frank Sinatra with the help of four robust and polished guest singers, Storm Large, Tony DeSare, Frankie Moreno and Ryan Silverman. 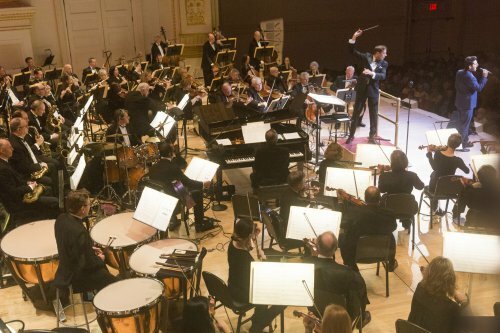 The New York Pops, founded by Skitch Henderson in 1983, is the largest independent pops orchestra in the United States and the only professional symphonic orchestra in New York City specializing in popular music. As conductor, Reineke’s enthusiasm for the music, as well as his esteem for Sinatra, was infectious. The orchestra begain with a lush instrumental version of John Kander and Fred Ebb’s “New York, New York,” Sinatra’s 1980 hit. The evening started on a high note and took off from there. Reineke told of his admiration for Sinatra. “Chairman of the board,” he called him with great warmth, one of Sinatra’s many nicknames. Moreno, who was named Las Vegas Headliner of the Year two times running and gained notoriety for his 2013 performance of his hit “Tangerine Honey” on ABC’s Dancing with The Stars, was the first singer of the evening. Dressed in a brown suit, black shirt and black tie, he sang Isham Jones and Gus Kahn’s “It Had to Be You.” Moreno was a vivacious performer, a true showman. The arrangements were as famous as Sinatra. He worked with such greats as Harry James, Tommy Dorsey, Billy May, Quincy Jones and Bob Costa. Reineke chose a fair cross section of the cherished favorites while offering a fresh take on others. A good number of Nelson Riddle arrangements were highlighted, the first of the evening being Cole Porter’s “Night and Day” performed by DeSare, who did the song justice. He later sang, another Riddle arrangement, “I Have Dreamed” by Richard Rodgers and Oscar Hammerstein II. DeSare proved to be a skilled musician. The accomplished singer/pianist has also won first place in this year’s USA Songwriting Contest. The audience received a sample of his musicality when he sat down at the piano alongside Moreno to play a four-handed arrangement of “All of Me,” written by Gerald Marks and Seymour Simons. This thrilled the audience as it should. Unfortunately, there is was a weak point in the lineup of great tunes, orchestrations and performances. DeSare and Large sang a version of Johnny Mercer’s “Something’s Gotta Give” arranged by DeSare himself. The pace was sped up to almost that of a patter song, which renders the lyrics, that are cute and catchy, unintelligible, compromising its phrasing. Ryan Silverman, who recently received critical acclaim for his starring role in the Broadway production of Side Show, has a timbre to his voice that is warm and cuddly, particularly in the lower register. 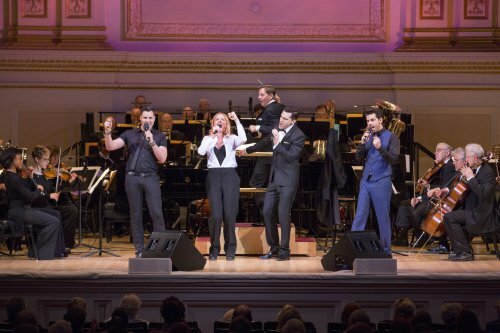 His acting talents help put over a song as only a Broadway leading man can, while he was present and supportive of his colleagues sharing the stage. With Large, he gave the humor, charm and irony to “Somethin’ Stupid” by C. Carson Parks that made it the Sinatra hit that it is. The New York Pops in “Let’s Be Frank,” as usual, spotlighted a genre, directed it and presented it in simple terms as they rejoiced and shared it with the audience.